Now a days horse racing is getting more popular in many countries. This article gives you complete information about horse racing. Different types of horse racing events are included in this article. Details about horse racetracks and distance are also quoted in this article. Horse racing is one of the most interesting and popular sports events. In horse racing there will be a horse for riding and a jockey who rides the horse. According to study the emergence of horse race occurred in Egypt, Babylon and Syria. Thoroughbred racing was one of the most popular event in horse racing. Horse racing is of three types. First event in horse racing is Flat racing. Another event is steeple chasing, which requires some jumping skills and techniques. The third event in horse racing is harness racing, which requires more speed and pace in horses. Compared to other sports events, horse racing is one of the dangerous sports event. Both horse and jockey may fall in danger while riding, so this is a risky sports event compared to other sports. There are different types of horse racing which are having different location and distance. More details are given below. Thoroughbred racing is the famous type of Horse racing event. Thoroughbred racing include different events like Flat racing, conditions races and handicap races. 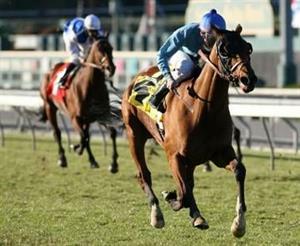 Thoroughbred racing will be conducted in a dirt, synthetic or turf surfaces. Normally the distance of the race will vary between five and twelve furlongs. There are different rides in Endurance racing. All rides will have different length, it can be short or long. More details are given below. Quarter Horse racing was conducted in straight tracks. More speed and strength of horses are judged in Quarter Horse racing. Distance to cover for Quarter Horse racing will be 100 mts or one quarter of a mile as the name of the race suggests. Horse racing is very popular in US. More details about Horse racetracks in US are given below. * Santa Anita Park, in the San Gabriel Valley community of Arcadia: Located in California in the Los Angeles area and opened in 1934.